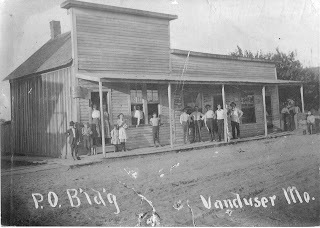 This is the Vanduser Post Office in 1910. The middle building is a barber shop as the barber pole is attached to the porch upright. The other building is a restaurant and something. The Post Office also sells shoes per the sign to the left of the door. This photo hangs in Genny's Cafe in Morley, Missouri.